GABORONE, June 25 (Xinhua) — The Southern African Customs Union (SACU), Mozambique and the European Union have started talks to conclude a new economic partnership agreement (EPA) with post-Brexit Britain. In an interview on the sidelines of the SACU meeting on Monday in Gaborone, capital of Botswana, Paulina Elago, SACU executive secretary, said a SACU-Britain ministerial talks held in Johannesburg, South Africa last year agreed to replicate the EU-SADC-EPA as an immediate step to avoid trade disruption. "Both parties have shared textual proposals on the changes to maintain EPA text, annexes and protocols," she said. She said the parties have also agreed that the Cotonou Agreement would no longer apply to Britain when it leaves the EU and it had made a proposal in the new agreement. African, Caribbean and Pacific (ACP) developing countries and EU signed the ACP-EU partnership agreement, dubbed the Cotonou partnership agreement, in Cotonou, Benin, on 23 June 2000 for a 20-year period from 2000 to 2020. The Britain-EU Withdrawal Agreement runs from April 1, 2019 to December 31, 2020 and during such period, Britain will be treated as an EU member state and will remain party to EU’s international agreements, including the EU-SADC-EPA. She said SACU was in the process of analyzing the essential elements of the Cotonou Agreement, which SACU and Mozambique would propose to be part of the new agreement as counter proposal to the proposal by Britain and the implications of the Britain-EU implementation agreement. Elago said the roadmap to conclude the engagement had been revised and was envisioned to conclude discussions by the end of August to pave way for legal scrubbing of the final texts, signature and ratification of the agreement next year. 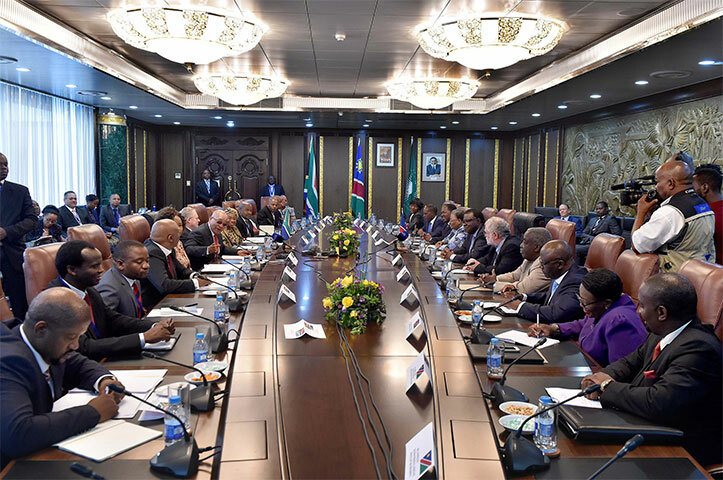 The SACU meeting, started on Monday and will end on Friday, is a customs union among five countries of Southern Africa — Botswana, Lesotho, Namibia, South Africa and Swaziland.